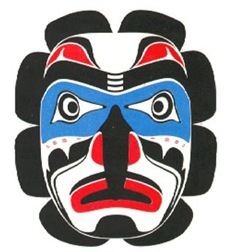 The Kwakiutl are one of the Kwakwaka'wakw tribes and are an indigenous people who live in British Columbia on northern Vancouver Island and the adjoining mainland and islands around Johnstone Strait and Queen Charlotte Strait. Done in various shades of complimentary dichroic and colored glasses. Constant colors are black and white . 12x20 on 8x8 Plexiglas stand.